Internal Medicine in the veterinary field focuses on many of the same diseases as internal medicine for humans. Diseases of the gastrointestinal, hepatic, renal, urogenital, vascular and pulmonary systems are often complex. Diagnoses can be difficult for many reasons, one of which is that clinical signs can be indicative of many different ailments. I’m lucky enough to work with other highly trained specialists to ensure that we get it right so that we can customize the best treatment plans for each pet we see. As a person, I am compassionate toward and passionate about animals and their well-being. As a vet specializing in internal medicine, my primary goal is to uphold a happy and healthy life for each of my patients. Many of the diseases we treat are painful or at least make dogs and cats pretty uncomfortable. Throughout treatment, we focus on our patients’ comfort while working toward a cure. I mentioned the most commonly affected body systems above, and want to help educate pet owners on the most frequently-treated internal diseases. If you believe your pet is experiencing signs and clinical signs associated with any of the illnesses discussed below, contact your primary vet for an initial evaluation and ask for a referral to our team at CARE. Gastrointestinal disorders affect the stomach and intestines, causing pain and other problems such as dehydration, acid-base and electrolyte imbalances and malnutrition. Though there are many types, there are a few overlapping causes to keep in mind: (1) eating human food; (2) food allergy or intolerance; (3) infection; (4) lack of digestive enzymes. Hepatic diseases affect the liver, which helps with digestion, blood clotting and removing toxins. Diseases of the liver are often treatable or at least manageable. 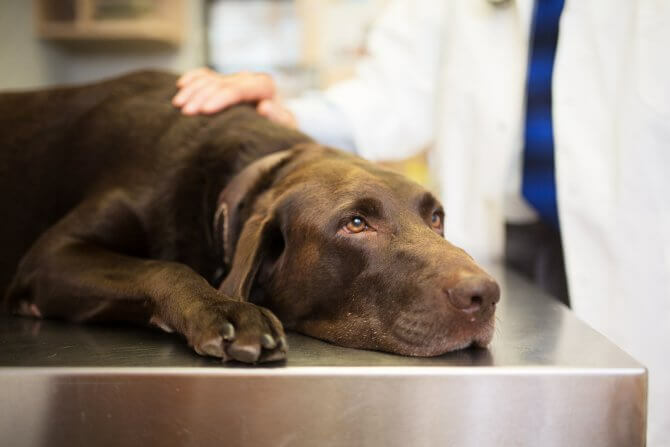 Dogs and cats may develop a hepatic disease due to aging or genetics, but there are other causes that pet owners should know about: (1) infection or trauma to area; (2) medications; (3) diabetes; (4) fatty foods; (5) untreated heartworms. The clinical signs are easy to miss because they are similar to those of many other problems. Renal diseases, also known as kidney disease, occurs when one or more of the kidneys fail. More than one in ten dogs and between 20 and 50% of older cats develop renal disease over a lifetime. The kidneys are responsible for filtering blood, processing protein wastes and excreting them into urine, conserving and balancing body water, salts and acids and maintaining normal red blood cell levels. Common causes include: (1) infection; (2) kidney stones and blockages caused by kidney stones; (3) genetics; (4) cancer. Unfortunately, dialysis and transplants are not available to dogs and cats, so treatment is limited to symptom management. There are multiple types of urinary diseases, all of them differing in severity and seriousness. Vascular diseases range from problems with the arteries, veins and vessels that carry lymph nodes to disorders that affect how blood flows. There are two main categories of vascular disease in pets – congenital and acquired. Congenital cases are so rare that I’ll mention only the most common type of acquired vascular disease that Internal Medicine treats. Rocky Mountain Spotted Fever, which is caused by tick bites, is treatable through two to three weeks of antibiotics. Chronic Obstructive Pulmonary Disease (COPD), also referred to as Chronic Bronchitis, affects dogs and cats in much the same way as it affects people. While COPD progresses slowly, it is irreversible. It is signified by incessant coughing. To date, we blame second hand smoke, air pollutants, allergens, dental disease, recurrent respiratory system infections and obesity as the primary causes of COPD in pets. Treatment consists primarily of trying to make the patient more comfortable as the disease progresses. Therefore, we may prescribe bronchodilators, cough suppressants, antibiotics and/or corticosteroids to decrease the inflammation and ease the coughing. If your dog or cat is experiencing any of the clinical signs associated with the diseases I’ve discussed, speak with your primary vet and set up an appointment at CARE. Along with my team, I will work to diagnose and treat your pet. We want all animals to live their best possible life, and luckily, many of the diseases we treat are curable, especially if found early. To contact us directly, our number is 704-457-2300.